(MacDougall/McDowell) sounds like in the ancient tongue (Scots Gaelic). Once upon a time, a member of our family was asked… “Where do the MacDowalls come from?" His quick response was… “We've always been here. The MacDowalls are older than the sun”. This explanation of the McDowell origins is reminiscent of that of our Irish cousins, the O'Neills (Ui Niell), of whom it is said “…cannot be traced back to Noah, because The O'Neill' had his own boat”. Exaggerations notwithstanding, both families are indeed ancient. The MacDowall/McDowell family name is from the Gaelic “mhic dhu ghaill”. It is derived from the personal name Dougall (or its variants Duegald, Dhugal, Dugall, Douwal, and Dowall) from the Gaelic “dhu ghaill”, meaning `dark (or swarthy) stranger'. It was used as a descriptive name for an individual or to refer to the Danes, (as opposed to “fion ghaill” meaning `fair stranger' used to describe Norsemen). Mac, M', Mc, or Mhic, also from Gaelic, mean “son of”. The “dhu” is pronounced “khoo” as in “who”, sometimes with a very soft “K” sound in front. The “gh” (as in “ghaill”, from Gaelic,) is pronounced as a very soft “v” or is silent altogether. The mutation to a “w” was an anglicization introduced under our fifth cousin King Edward I “Longshanks” of England (1272-1307) because of the difficulty incurred by the English in pronouncing the Gaelic version. The “e” (in the “ell” at the end of the name) is the Irish spelling. In present day Scotland, the predominant pronunciation of the name is MACK DOOL. The surname McDowell is the 626th most common surname in the United States, and is most often pronounced MAC DAH-WELL. The patronymic namesake ancestor of the MacDowalls is thought to have been Duegald de Galloway, who was killed in our family's ancient homeland of Galloway Scotland in 1185. Duegald was a younger son of Uchtred, the 2nd Lord of Galloway and the grandson of Prince Fergus de Galloway, 1st Lord of Galloway and his wife Princess Elizabeth, the natural daughter of King Henry I (Henry Beauclerc) of England (1068-1135) and thereby, the granddaughter of King William I (William the Conqueror) of England (1027-1087) - who descended from the Dukes of Normandy and Rolf the Dane (d. 927). However, the name could be related to a much earlier historical personage by name of Douval (Dowal or Dovallus), who according to historians also lived in Galloway, in southwest Scotland, as early as 232 B.C (but probably a more realistic date for this is around 730 A.D.). Douvall was recorded by Roman historians for the act of having killed the despotic King Northathus. However, the family line itself can be traced at least as far back as about 200 B.C. as descending from Prince Fiacha Firmara of Eire, according to the ancient Irish chroniclers in the Book of Ballymote. The first recorded written instance of the McDowell-like surname was by one Fergus McDhuile who was a juror at an inquest at Berwick in 1296. Before that, the territorial name de Galloway was used. Additional variations in the spelling of the name include a recording in 1306 by Fergus MacDowile (a witness to a charter by William, Lord of Douglas); a Duncan McDuel in 1307; and in 1312 by Sir Dougal M'Douwille (sheriff of Dumfries and Constable of the Castle) and his brother Fergus M'Douwille; in 1416, by a Gilbert Macduyl; in 1515, by Uhtred Mcduwell; and by another Uhtred McDow-gall in 1617. Successive changes to the name include: In 1547, the name was spelled M'Douell; in 1615 M'dule, and in 1684 spelled McDoul. By the year 1700, it had become McDowell or McDowal in Ulster (Northern Ireland), McDowell in America, and MacDowall, MacDougall, or McDouall in Scotland. Other variations and spellings include McDowyl, McDougal, McDougald, MacDougall, McDugald, Dole, Dow (or Dowl), Doyle, Madole, and McDool (using either the Mc or Mac, or dropping it entirely), in addition to the original Gaelic sounds retained in the names variants of MacCool and MacKown. Also, one branch of the family uses the original territorial designation based on “de Galloway” - Galloway. One of the things not established is why the change of surname occurred from the territorial designation of de Galloway to the patronymic MacDowall. The latter was apparently adopted by the descendants of Duegald (or Dougal) de Galloway, the younger brother of Roland de Galloway and thereby the uncle to both Alan de Galloway, last Lord of Galloway of that line, and Thomas de Galloway, jure uxoris Earl of Atholl. Perhaps it was because the lordship had passed into the hands of the de Balliol family on the marriage of Alan's ultimate heiress, Devorguilla de Galloway to John de Balliol of Barnard Castle, county Durham and the territorial name was considered to have become inappropriate to earlier stirps (descendant lines). It is probable that from Duegald, if not from Alan's natural son Thomas, the three main families descend. Macdowall of Garthland, the McDoualls of Logan and Freugh, as well as the Macdougalls of Makerston and MacDowalls of Stodrig, not to mention the numerous other cadet branches, all landed, and possibly armigerous, such as the MacDowalls of Machrimore, Knockglass, Dalreagle, Lefnall, Corochtrie, Crookuncrush, Myroch, Mindork, and the McDoualls of Crichton, Ardwell, Culgroat, Hackburn and Stratford Hall. Truly a numerous progeny, some eighteen separate “houses” in all. While the MacDowalls, MacDoualls and MacDougalls flourished in Galloway as landed families and holders of such important offices as feudal barons, Sheriff Deputes and recipients of knighthoods, the line of Deugald's nephew Alan de Galloway ended without male heir and that of his nephew Thomas, Earl of Atholl, sunk into obscurity in the environs of Cupar-Angus Abbey. Yet, on the face of it the Earl of Atholl's descendants should have been the ones who flourished. By his marriage to Isabella, Countess of Atholl, Thomas de Galloway became jure uxoris one of the Seven Earls of Scotland, one of the Righ, the “kings” who governed Scotland under the Ard-Righ or “high-king” - the King of Scots. Unfortunately, Thomas had one legitimate son only, Patrick de Galloway, who succeeded his mother as Earl of Atholl, but was killed in 1242 during a feud with his kinsmen the Bissets. He died at age 31, unmarried, without issue and the earldom reverted to the blood relations of his mother. Thus what might have been the most promising of Fergus' line ended abruptly. Meantime, this illegitimate side of the family retained their territorial surname, reasoning possibly, that it was all they had to commemorate their forebears' illustrious past. Some generations later, however, a peerage was conferred on a Cupar-Angus Galloway when Sir James Galloway was created Lord Dunkeld by King Charles I. In its third holder this peerage was attained because that Lord Dunkeld had adhered to the cause of King James II (of England) and VII (of Scotland) and had fought under Dundee at the Battle of Killiecrankie. His line is considered extinct. Past generations of our forefathers have maintained, in the oral tradition of ancient cultures, the legend that our ancestors the Lords (or Princes) of ancient Galloway were descended from Dovallus (Dowall), a Prince of Galloway who in 230 B.C. killed the tyrant No(r)thatus, King of Scotland, and set up Reutherus in his place. In remembrance of this, in the words of Sir George Mackenzie (ca. 1680), this family used to bear as Arms, “a Lyon collared with an open Crown about his Neck”. Mackenzie, who was Lord Advocate to two successive Scottish kings, also noted that this family name “is known to be among the ancientest Sirnames of Scotland” and Dovallus is mentioned as the father of the 14th King of the Scots. The Dovallus of the legend must be the latinized version of our eponym Douall, Dougall or Dubh Gail (the dark stranger) and it undoubtedly refers to a traditional leader of Galloway, or Gail Gaedhil (the Stranger Gaels), in a native, dynastic and governing family. By definition, a legend is a history that is not verifiable, but which unlike a myth, may contain more truth than fiction. The survival, support and independence of that petty sovereignty was maintained under a succession of conquering races, basically through collaboration. This nature of ancient Galloway is well documented. Historians should not be shocked by the old family contention that our name was a Gaelic patronymic applicable to the Lords of ancient Galloway down to Devorguilla (d. 1290) mother of King John I (Balliol) of Scotland. Their Norman, feudal, territorial designation “de Galloway” is all that has survived on record. Nevertheless, Somerled the King of the Isles and his descendants (the Highland MacDougalls and Clan Donald) are accepted as MacGodfreys. Their eponym Godfrey (d. 853) son of Fergus, was ruler of the Western Isles (Innsi Gall) and Lord of Oriel (ie. of the people Airgialla just west of Irish Dal Riata). 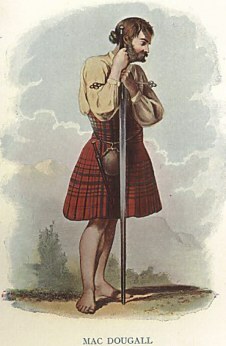 He went to Scotland to reinforce Kenneth MacAlpin, who married Godfrey's daughter.5 Thomas de Galloway, Earl of Atholl, brother of the last “ancient Lord” Alan, was sometimes cited as Thomas MacUchtry after his grandfather Uchtred, the son of Prince Fergus.3 Is it possible that Douall is an allegory of Gallowegian leadership? Considering that the Iron Age people invaded Britain ca. 250 B.C., how credible is the year 230 B.C. in the legend? It is not as extreme an invocation as are a number of claimed descents from Adam! But, it is immodest in relation to the apparently authentic pedigree of Somerled (d. 1164) to before the 5th century Dalriadic colonization of Scotland5 . Nevertheless, the first Roman historian was active in 230 B.C. and Celtiberian cultures had reached North America before that, well ahead of the Vikings and Columbus. In fact, Columbus himself traveled to Eire in 1472 to view records of the journey made by St. Brendan the Navigator, before setting sail for the “new world” in 1492. Author's note: St. Brendan and a group of 14 fellow Irish monks sailed from Eire around 570 A.D. to America via Alban (Scotland), the Shetland-Faroes, Iceland, and Greenland, and remaining in America as long as seven years before returning home to Eire as documented in the Navigatio Brendani. Recent archealogical evidence found in America supports these early chronicles of the St. Brendan expedition. Not the least of this evidence are the Celtic stone structures and the ancient petrogliphs of Celtic Olm (Ogam) or “tree script” found at sites at Tazewell, Virginia and Wyoming County, West Virginia. These sites are scattered from the coastal area of New England (Groton, CT), leading inland and along the ancient Indian “highways” - the ridge roads of the Appalachian mountains. These American sites often display the distinctive “Chi Rho” inscriptions (symbolizing the name of Christ), found at numerous other known St. Brendan-related sites in Eire (Ireland) and Britain. There is a clue in the last name of the legend - Riata. Fordun lists Rether among early Scottish kings. In his History the venerable St. Bede (a monk, 673-735 A.D.) called the “Father of English History”, wrote as translated, “...the Scots migrated from Ireland under their chieftain Reuda and by a combination of force and treaty obtained from the Picts the settlements that they still hold. From the name of this Chieftain they are still known as Dalreudians, for in their tongue dal means: a division.” In St. Bede's History this information appears in the context of pre-Julius Caesar Britain (60 B.C. ), but in relation to preceding events Bede did state that the Scots “later migrated”. It is usually thought that Bede was referring to the establishment of Scottish Dal Riada (ca. 500 A.D.). However, we know exactly that this kingdom was founded by Fergus and his two brothers Loarn and Angus, sons of King Erc of Irish (North Antrim - Ulster) Dal Riada. Erc was descended from the Ulidian royal house through the semi-legendary Conaire Mor, who was a high king of Ireland at the time of Christ, according to the sennachies5 (storytellers - oral historians). The name Reuther (th and d are identical in Gaelic) may be an older eponym of Dal Riada, perhaps a legendary, allegorical name for Dalriadic leadership. This supposition is historically supported a century after Bede's death by an event that would have reinforced our own legend, if it did not in fact initiate it. After the Romans evacuated Britain, the invading Saxons displaced from Galloway (ca. 552 A.D.) the tribe of Dalriadic Scots (probably of Cowall) and also the Picts who had settled there. These people fled across to the over-kingdom of Ulaid (Ulidia in Ulster) in Ireland, where they were known as Cruithne, pronounced “Creenie” and meaning Picts. Later, in 741 A.D., the Dalriadic Scots of Argyll under Alpin were also driven away by the Northern Picts to Ireland and to Galloway, in which later place Alpin's son Kenneth MacAlpin, who had grown up in Galloway, mustered his kinsmen, Dalriadic levies and some allies and swept back into Dal Riada and the Pictish vacuum. To this end the Cruithne came over from Ireland under their leader named Reuda or Redda, and with a host of Galwegians assisted Kenneth to ascend the Pictish throne as King of Albany. (Alban being the ancient name of Scotland.) Were the Galwegians led by Dovallus? Was Northatus the current Norse or Pictish leader in the North, or an allegory of him? There were many occasions when the Romans were balked in their battles with the Brigantes (the indigenous Britons) even after the annexation of the Southern part of Britain to the Roman Empire in 50 A.D. It was not until about 69 A.D., however, that Caledonian Britons first came into contact with the Romans. This happened when Britons from all quarters came in support of the Northern faction of the Brigantes under King Venusius. In the major contest that followed, Venusius at the head of a powerful army fought a series of battles against another ruler of the Brigantes, his former Queen and Roman collaborator Cartismandua, who had the support of the Roman army under the government of Vettius Bolanus. Venusius was victorious and won back sovereignty of the whole nation of the Brigantes. It was only ten years later, however, that Agricola penetrated the North shore of the Solway into Galloway, in his second campaign, where he “surrounded the subjugated tribes with forts and garrisons the remains of which are still seen in Dumfries, Kirkcudbright and Wigtown.”10 This completed the Roman assimilation of the great and extensive nation of the Brigantes. It is therefore fitting to note that Dovallus (Dowal), this legendary eponymic predecessor of our family, was allied to, if not one of, the Britons of the Novantes sept in pre-Galloway; and further, that after the fall of the Roman Empire these people became part of the Strathclyde kingdom of the Britons, which later evolved into the Norse province of Galgeddil (pre-Galloway) and the Scottish sub-kingdom of Cumbria, the last native ruler of which was Owen Galvus `Mac Dowall'. Author's Note: Portions of the articles “The Legend” and “The Origins of Prince Fergus, Lord of Galloway” are contained herein and were most graciously provided to this author by Dr. Fergus Day Hort Macdowall, Baron of Garthland and Castlesemple, (27th Chief of the Name and Arms) from the limited publication: The MacDowalls of Galloway. A Journal for Historical Research. Vol. I, No. 1, May 1987 and Vol. 1 No. 2, Dec 1987. Agnew, Sir Andrew. A History of the Hereditary Sheriffs of Galloway. 646 pp. Adam & Charles Black, Edinburgh, 1864. Nisbet, Alexander. Heraldry, Vols. I and II, Edinburgh, 1722. M'Kerlie, P.H. History of the Lands and their Owners in Galloway, Vol. II 508 pp. Wm. Patterson, Edinburgh, 1877. M'Kerlie, P.H. History of the Lands and their Owners in Galloway, Vol. I 530 pp. Wm. Patterson, Edinburgh, 1870. Sellar, W.D.H. The Origins and Ancestry of Somerled (Scottish Historical Review, 45: 123-142), 1966. Grun, Bernard. The Timetables of History. 676 pp. Simon and Schuster, New York, 1982. Fell, Barry. America B.C. : Ancient Settlers in the New World. 312 pp. Quadrangle/The New York Times Book Co., NY, 1976. Skene, Wm. F. The Roman Province in Scotland. Chapt. II In: A History of Ancient Alban. Vol. I. 509 pp. 2nd Ed. David Douglas, Edinburgh 1886.